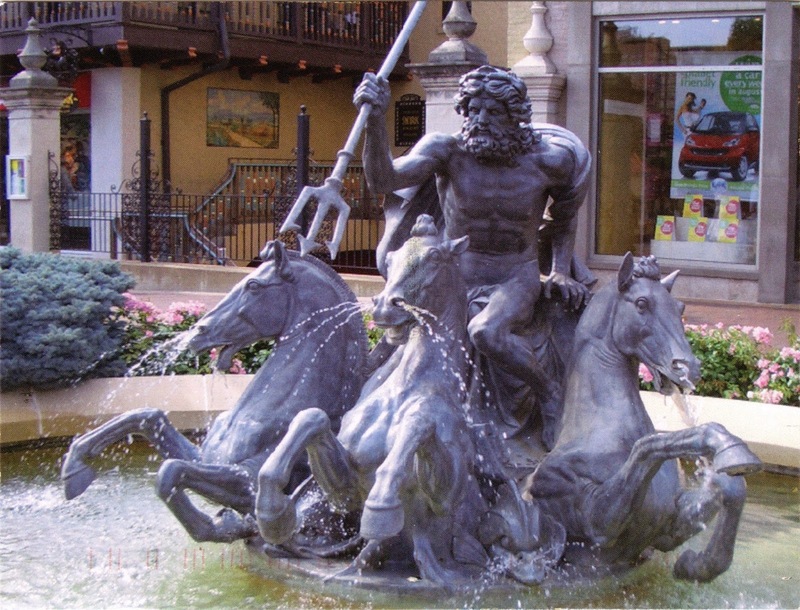 Kansas City, Missouri is known as the City of Fountains. Among all cities in the world, only Rome, Italy has more fountains. Postcard US-2441790 shows its Neptune Fountain, a 3629 kg or 8000 pound cast lead fountain in an oval pond. It depicts Neptune, the God of the Sea (and father of fictional character Perseus "Percy" Jackson), in his chariot pulled by three mythological attributes, the trident, dolphin and sea horse. The fountain was cast in 1911 by the Bromsgove Guild of Applied Arts, a group of artists and designers that operated from 1898 to 1966. from Worcestershire, England. Google books has an ebook on Walter Gilbert who founded the group associated with the Arts and Crafts movement. The fountain was for the Pennsylvania estate of Alba B. Johnson, then president of Baldwin Locomotive Co., who passed away in 1946. Miller Nichols, a local real estate professional who was inducted to the Greater Kansas City Business Hall of Fame in 2011, bought the piece as scrap metal after workmen at a salvage company found it in a railroad car. The JC Nichols Co. installed it on the Country Club Plaza in 1953. I was in Kansas City for the URISA's 43rd Annual Conference from October 9 to October 12, 2005. However, I missed this fountain. One of the city's most spectacular water displays was the Crown Center Fountains near the conference site Hyatt Regency Kansas City (now Sheraton Kansas City Hotel) at Crown Center, an office, retail, and entertainment complex housing the international headquarters of Hallmark Cards, Inc. I look forward to visiting more fountains when I am in Kansas City next time. You can find a list of fountains in Kansas City at Wikipedia. ExperienceKC.COM has an article "City of Fountains: tour the stunning structures that gave Kansas City its claim to fame."